Have you ever noticed that everything seems worse when you’re tired or hungry? Think about it. You might not be having the best day, but it’s not awful. And then, as you go from meeting to meeting or run errands, you miss lunch. And what happens? You get cranky. Maybe a headache comes on. You lose your patience with co-workers or your kids. And your day has gone from bad to worse. This was me a few weeks ago, but not because I missed lunch. I did something to my back, although I don’t really know what. One minute I was fine. The next minute I sat down for dinner, and I felt something slip out-of-place. It was painful, but not awful. Over the next few days, it got worse, until I could barely move. It didn’t matter what anti-inflammatory medications I took, or how long I kept the heating pad on, I couldn’t move. The pain meant I wasn’t sleeping either. And it doesn’t take long for lack of sleep to catch up with me. I prayed for healing, but instead, I slept. He knows our basic human needs. And He knows when they’re not being met. Everything seems worse when we’re tired or hungry…or in Elijah’s case, both. I’ve never actually had to run for my life, but I’ve been at the end of my rope like Elijah. God, I’m tired of this. I can’t do it anymore. Maybe you’ve felt that way before too. I imagine Elijah would’ve liked God to do something about the people who were trying to kill him. But instead, God gave Elijah rest and food. Everything seems worse when you’re tired or hungry. God knew that before Elijah could think clearly again, he needed two basic needs met—sleep and food. Aren’t we the same today? When the lack of sleep took me under, the pain in my back was out of control and I couldn’t focus on anything else. But after a night of rest, I was able to think a little more clearly. I was still in pain, but God met my basic need of sleep. And later that day, I could feel my back start to relax. We want to get right to the result—problem solved. But sometimes, God wants us to see something else first. He wants us to see Him in our everyday basic needs. And with that clearer vision, we can see Him at work in our end-of-my-rope moments. Laura Rath is a follower of Jesus Christ, a wife, mother, writer, blogger, and works in church ministry. She continues to grow daily in her relationship with God and loves the faith journey she’s on. Laura is a monthly contributor for 5 Minutes for Faith, and hosts an online Bible study, using books relevant to women today. She can be found at Laura Rath ~ Journey in Faith, where she shares from her heart and encourages others in their walk with the Lord. You can also connect with her via Facebook or Twitter. I am not a huge fan of cleaning. I mean, I try to keep our house in decent-ish order, as in keeping the dishes contained to their sink/cabinet areas and preventing any accidental science experiments from growing in the back of the fridge. However, as much as I loathe the day-to-day cleaning experiences, I do occasionally get in a mood to sort, organize and purge. In those moments, nothing can stop me from tearing apart the nearest coat closet or office desk drawer. As an army family, we move a lot– and when we move, that is the ideal time to clean. And purge. It is then that the non-purposeful item makes a trip to our local Christian thrift store or Goodwill to fulfill its purpose somewhere else instead of sitting idly on a shelf or in the bottom of my closet. As I was reflecting on the latest chapter of our bible study in “Calm My Anxious Heart” by Linda Dillow, I couldn’t help but think… How many people in this world are living their lives like those “why-do-we-even-have-this” items? We are all designed with a purpose. God has a purpose for YOU. He planned you with a purpose. Are you fulfilling it? Or simply drifting through life, waiting for the next steps to happen? I don’t know about you, but I really want to be USEFUL to God, to be fulfilled by Him while fulfilling the purpose He has for me… I desire to be His good and faithful servant– not just watch life drift by as I figuratively collect dust and grow old. When we float through life without a focus, contentment is impossible. The Knoblochs and our life purpose statements… as permanent reminders. Do you have a life purpose or mission statement? What is it? Let’s encourage each other on this journey– leave your comments below! Our lives are not meant to simply drift. When we have something to live for (Christ,) contentment comes much more easily. In life, we are not to collect dust or drift aimlessly or be shoved in the bottom of a hypothetical closet. We are ALL planned with purpose. What’s yours? If you are “Officially” participating in our weekly bible study, here is chapter 8’s homework in Calm My Anxious Heart! Enjoy!! Day 2: Question 3. a., b., c.
Now before I continue, it’s important to understand that I am stubborn. (Like you didn’t already know that.) But yes, I am stubborn… So whenever it came to the point in the process of moving the couch, I always thought I was bigger, badder and stronger than I really was. In fact, I once helped my dad move my big ol’ honking couch out of my apartment after of college graduation– and severely pulled a muscle in my back. Not fun. But I digress. 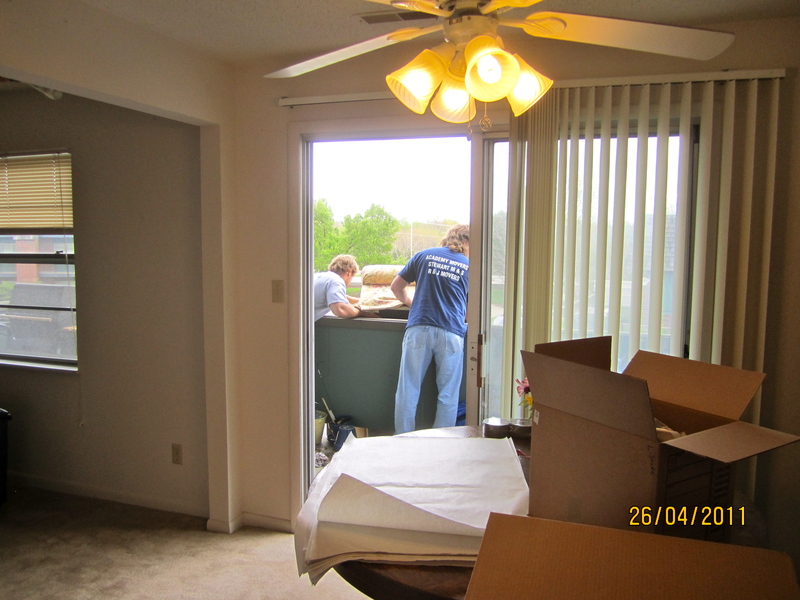 The last time we moved our huge couch was from our apt in KS to our home in GA… It was so huge the movers couldn’t figure out how to get it out of the apartment door… So they lowered it down over the balcony. True story. Sometimes our daily lives are like moving a couch: heavy, sweaty and exhausting. And, if you are anything like me, sometimes we think we need to do it ourselves (or with very minimal help.) God calls each of us to individual fulfill a variety of purposes in our lives. Think to yourself for a moment about the “heavy lifting” required in your life? Perhaps it is ministry, writing, parenthood, marriage, your career, you fill in the blank. It can get overwhelming and we simply can’t do it alone. This last weekend at SheSpeaks, I attended a breakout session by Micca Campbell entitled “Fear Not.” Her entire session was entertaining and moving… However, one illustration in her message really stood out and spoke to my heart. She recalled a time that she attended one of her first bigger speaking events. She was excited to address 400 women, but as she was waiting, the hostess and pastor’s wife began to tell her about a “big name” speaker that had been there the year before. Isn’t that great?!?! WELL DUH!! If God doesn’t show up to help us with whatever we are trying to accomplish for Him each day, of course we have nothing to give. Praise Jesus we don’t have to do the heavy lifting by ourselves. When in your life have you thought you had to “do it yourself?” How did it turn out? When have you let God help and do His thing? What was the difference? Share your experience and join the conversation below. Personally, I am beyond thankful and relieved that I DON’T have to do any of this by myself. If I did, I would end up with much more than pulled muscles and a sore back. But instead, God’s presence in my life gives me a strong heart to press forward knowing that HE is the one that is going to shine… He’s the one that will do our heavy lifting. Ladies and Gentlemen… it’s finally happened. Please, give me a moment to prepare. I am guest posting for my boss!! Ok, she really doesn’t like it when I call her “Boss.” (At least that is what she SAYS.) But Kelli Wommack isn’t just my boss. She is my mentor. My personal cheerleader. My coach. And my best Georgia friend. Anywho, I have the incredible opportunity to guest blog for her today… please hop on over to Living for One to view my post on how we can “do it all” by Living for One in our 7 Days Time. Don’t be shy about commenting here and there, as well as sharing with your friends! God’s blessings to you all!